Firstly, we were interested to note recently that Nike are to pull out of the activity tracker market. They were the first major sports apparel company to enter the space, and were the originators of fitness bands with their innovative and popular Fuelband product. 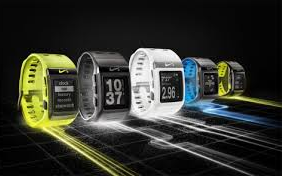 As part of this announcement, Nike indicated that they intend to focus on the software side of their business, and this is highlighted amply here by the fact that the technology behind this watch is actually powered and created by TomTom. So what the heck is the Nike+ watch? Tired of carrying your iPod or (difficult to carry ) exercise monitor around while working out? Your struggle is now over. Nike has announced its SportWatch, the thinnest and lightest wearable fitness equipment available in the market, weighing only ~2.24 ounces with a fully adjustable strap to fit different wrist sizes. The watch helps you keep a track of your speed, distance and pulse rate while you exercise and can also be worn casually as the device sports eye-catching yet relatively sleek aesthetics . It is shipped with rechargeable batteries that can be charged via USB and these provide a solid 8 hours of usage with GPS and sensors both turned on and 50 days of standby power when fully charged. By any calculations, compared against any electronic device, this is an impressive return on standby mode. The watch is fully waterproof, marking it out as a piece of fit tech that should be of interest to a wide range of athletes, including swimmers, outdoor runners, triathletes and anybody else who participates in a sporting activity that involves getting wet. The watch comes in various colors including black, white, silver and neon range. The box contains: Footpod, USB cable, watch strap, user manual and the Watch itself. GPS is an effective and reliable way of keeping a track of your speed and distance. 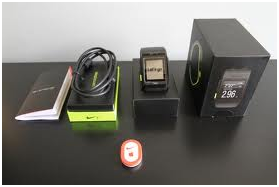 The Nike Sports Watch is the lightest and the smallest GPS activity tracker in market. It records your stats, allowing you to later view them on their website Nikeplus.com . The device tell see how fast you ran and for how long, keeping track of your each and every move while you’re working out. It also keeps a track of your calories burnt, which is very useful if you’re working on your weight. We have spoken extensively in the past about the accuracy of calorie counters verses the readings that you get on exercise machines, and you can read our thoughts here (opens in a new tab/window) – hint, the answer may surprise you. information to their website , which has a record of all your workout data. The website is your online trainer and the best source of advice for workout tips and measuring your long-term progress. It allows you to monitor yourself, challenge friends and your activities on social media platforms such as Facebook and Twitter. The watch will also remind you to work out if you haven’t done so in a few days, providing a subtle hint to get off your backside and to work towards nailing your overall training and body composition targets. The Nike+ SportWatch is compatible with a number of other fit tech accessories, including the Footpod and the Heart RateStrap. The Footpod comes along with the watch. It helps you keep track of your walk if you’re using a treadmill when the GPS is turned off, as most commercial gyms don;t receive a signal, and as you’re not actually moving, they would register a blank anyway. One Footpod per pair of shoes would do. 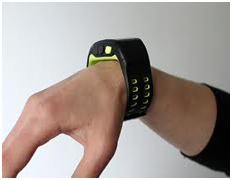 The Footpod can easily be connected to the watch and can be switched on or off according to your needs. in this amazing watch is a music player. Everyone likes to listen to music when going for a run, but without a built-in player, we had to settle for the classic iPod instead. Overall though, we found this to be a really interesting device, which offers a definite step up from a number of rival products, especially compared to the Adidas MiCoach Smartrun.